These practice Aural Tests & Quick Studies support the ABRSMs jazz alto and tenor sax syllabus Levels/Grades 1 - 3. They focus on musicianship skills central to the performance of jazz and to working by ear. 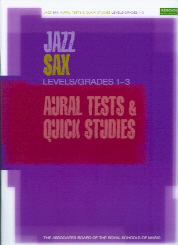 The Aural tests have been carefully devised to enhance listening, analysing and improvising, while introducing a full range of styles.